Upload images to the SmugMug site. Is there a better alternative to SmuginProForAperture? Is SmuginProForAperture really the best app in Internet Utilities category? Will SmuginProForAperture work good on macOS 10.13.4? SmuginProForAperture is a standard Aperture export plugin for fast and efficient upload of images to the SmugMug photo and video sharing site. Upload multiple images to SmugMug directly from Aperture. SmuginProForAperture adds custom fields to the Aperture metadata for exported images. 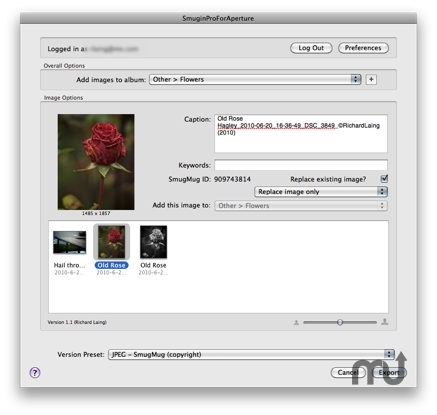 The generated custom fields can then be used to create smart albums of all images that have been uploaded to SmugMug, or to a specific album. Each image can be exported to a different gallery if required. You can choose whether to replace an existing image with a new version or add a second version of the same image to a new gallery. SmuginProForAperture the Notification Centre for status notifications.